The Western Swamp Banksia (Banksia littoralis) cones that inspired May Gibbs’ bad banksia men. Banksia plants are Australian emblems, famous for their colourful flowers and dark, knobbly seed pods — the inspiration of May Gibbs’ big bad banksia men. Just like those banksia men, unerringly creepy after all those decades, their real-life counterparts may be just as resilient to the impacts of climate change. 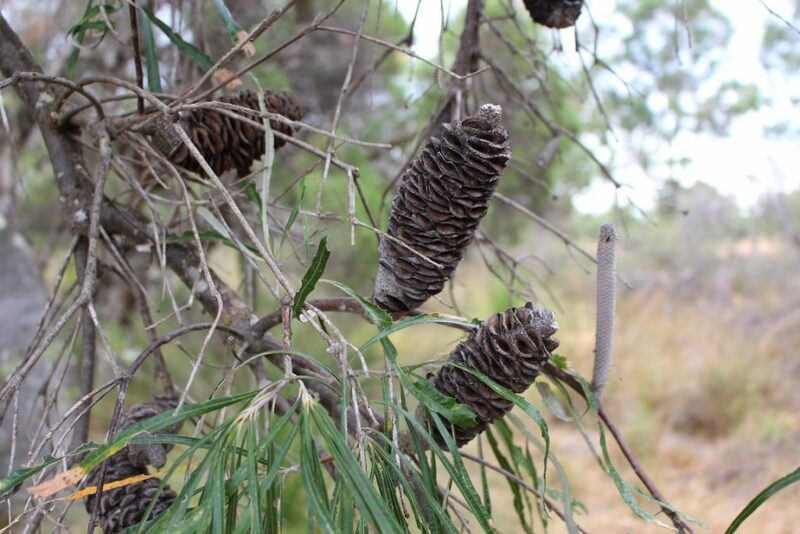 Researchers from The University of Western Australia (UWA) and Department of Parks and Wildlife (WA) surveyed six iconic banksia to assess the impact of climate change in south-west Western Australia. Since the 1970s, south west Western Australia – one of the world’s biodiversity hotspots – has become warmer and significantly drier. In addition, the science of biodiversity has gone digital, through Australia’s largest online biodiversity resource, our Atlas of Living Australia (ALA). Honours student Sarah Randell from UWA deployed an army of 40 citizen scientists to survey six banksia species at 300 different sites between Kalbarri and Albany. They then compared the results with data collected over 25 years ago for the Banksia Atlas, another citizen science project, which is now freely available through the ALA.
“We wanted to find out whether the banksias recorded in the 1980s are still there or, as predicted by modelling studies, are contracting southwards as a result of climate change,” Dr Kevin Thiele, Adjunct Senior Lecturer, UWA, said. The ALA was used to select the 300 different sites to visit, and the open source analysis tools were used to plot banksia distribution against climate conditions. “The climate change experienced since the 1970’s in the Southwest doesn’t seem to have affected the six banksia plants in this area. Weed invasion is so far the best predictor of local extinction for these species,” said Dr Thiele. 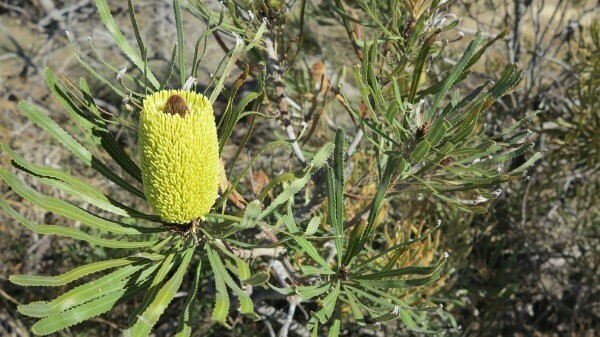 The Candle Banksia (Banksia attenuata) was one of six banksia species surveyed to determine the effect of climate change. For the moment, it seems our big bad banksia men are not intimidated by hotter and drier conditions, but stay tuned. “Resources like the ALA make species distribution studies much easier to carry out. These sites can be visited again in future, allowing these species to be used as a type of early-warning system for climate change loss,” Dr Thiele said. The results of the study will be presented at the Third Atlas of Living Australia Science Symposium at the Kieran Mcnamara Conservation Science Centre in Kensington, Perth from 11th – 13th May. The event is co-hosted by the Department of Parks and Wildlife (Western Australia) and the Atlas of Living Australia. The Atlas of Living Australia has been operating since 2007, providing free, online access to more than 60 million records on over 100,000 Australian species. You can find the Atlas of Living Australia here. It’s a great pity this study did not (as far as I can see) include Banksia iliicifolia which would have, possibly, put the hypothesis of this study under sharper challenge and even “bucked the trend” of the results of this study. This species grows just upslope of wetlands, where the water table is high but not high enough to seasonally waterlog the soil surface (a much more marginal habitat under climate change than any Banksia in the study, even the wetland species B. littoralis). I think this species might have been informative in the study for studying Banksia health under the decreasing ground water levels that accompany climate change as it was heavily affected on the Gnangara Mound in the early 1990s when Perth had is hottest spell for a while whilst groundwater extraction from bores near populations of this species continued. Banksia iliicifolia was the Banksia species that suffered in this process- well documented by botanist Ray Froend and others. Although the effect of the groundwater extraction was obviously a confounding factor in this, it highlighted Banksia ilicifolia as an important species to include in climate change studies. I applaud this study and only make my comments because I think it’s important for that the conclusions of this study are not over over-generalized. We have enough trouble conserving the Banksia Woodlands Threatened Ecological Community in Perth without the risk of the general public, the public service environmental regulators, and the politicians to be clear that this study does not prove that Banksia are somehow, tough as nails, and relatively buffered or immune from climate change. We are told which banksias suit eg the frosty winters of my area- is climate change altering the banksia map? or are the banksias evolving to suit the warming as you suggest? I find this article a little puzzling as the banksia has virtually disappeared from the Perth metropolitan area. 40 years ago it was one of the most common trees but today it is rarely found.